Sandia National Laboratories materials physicist Paul Clem holds a sample of glass coated with thermochromic vanadium dioxide nanoparticles. Photo: Randy Montoya. 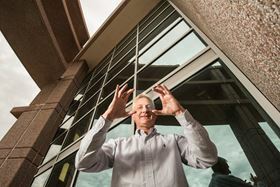 A partnership between Sandia National Laboratories and IR Dynamics, a company based in Santa Fe, New Mexico, is turning nano-size particles able to reflect heat, or infrared (IR) radiation, into window films for offices, houses and even cars. The partnership started in 2013 with the help of a New Mexico Small Business Assistance (NMSBA) grant. Paul Clem, a Sandia materials physicist, was studying films 50 times thinner than a human hair that can switch from insulating to conducting in response to changes in temperature. Clem was looking at their possible use in electronics when he met William Kurtz, who headed a company making energy-efficient aerogel-insulated windows and skylights. They met in a tech park in Santa Fe and started to discuss the need for windows that could automatically let heat in during winter months and keep it out in summer months. Some materials are reflective, like aluminum foil, and reflect light and heat. Other materials are generally transparent to light, like glass and plastic. A few rare materials can be both depending on their temperature. Vanadium dioxide is one such material. In fact, vanadium dioxide is thermochromic, able to change its optical transmission with temperature. At cooler temperatures, it is transparent to IR light. When it heats up, it becomes metallic and reflects IR radiation without blocking visible light. This dynamic switch between IR transparent and IR reflective is what gave rise to the company name, IR Dynamics. Vanadium dioxide materials switch due to changes in temperature rather than in response to an electric charge, as is the case with electrochromic materials. Electrochromic glass is a growing sector of the window industry, but it is expensive and requires infrastructure such as wires and switches. Because they switch due to the temperature of the environment, thermochromic materials are interesting scientifically and commercially. Supported by NMSBA grants and a Cooperative Research and Development Agreement (CRADA), a team of researchers including Clem spent several years trying to develop easy-to-apply polymer films containing thermochromic vanadium dioxide nanoparticles. Nelson Bell, a Sandia materials chemist, was primarily responsible for designing and implementing a multistage process to make the nanoparticles. He also determined the best way to disperse the nanoparticles in a spray-paint-like mixture. The biggest challenge, said Kurtz and Clem, was figuring out how to make the pounds of nanoparticles required to manufacture commercial products. In addition, the team worked on how to tune the switching temperature. For example, it might be best for car windows to start reflecting heat at 78°F, but another temperature might be better for other applications. By tweaking the ‘recipe’ and adding tiny amounts of different metals, the team was able to make nanoparticles that could switch at any temperature, from -40°F to 200°F. Characterizing these ‘batches’ of nanoparticles to make sure they had the correct properties was the responsibility of Raegan Johnson, a Sandia materials scientist. She used high-end equipment such as a Fourier transform infrared spectrometer, X-ray diffraction instrumentation and a transmission electron microscope to determine the infrared absorbance, chemical structure and physical structure of the nanoparticles. "A startup the size of IR Dynamics can't afford to purchase the diagnostic equipment that is available through Sandia Labs. Through the NMSBA and CRADA programs we are able to use those resources to develop the technology," said Kurtz. "It is important for small technology companies like ours to be able to partner with the national laboratories. I think that it is part of what keeps us competitive as a nation with the rest of the world." The first product Kurtz hopes to get to market is a film to retrofit windows: something homeowners could apply to their existing windows to reduce their heating and cooling bills. Future applications include incorporating the nanoparticles into new windows, and adding them to architectural plastics, such as the kind used in the Water Cube at the 2008 Beijing Olympics, or high-performance athletic clothing. In 2016, IR Dynamics received a $1.95 million grant from the US Department of Energy's Advanced Research Project Agency-Energy SHIELD program to bridge ‘the valley of death’ – a difficult period for start-ups before they produce a profitable product – and help make retrofit window films a reality. The goal of this program is to make single-pane windows as energy efficient as double-pane windows. If every single-pane window in the US was upgraded, it would reduce energy use in the US by about 1.3%, or roughly the amount needed to power 32 million US homes for a year. Most of the other projects funded through the program focus on reducing heat loss, which is a key concern nationwide. However, in some areas of the US, cooling requires more electricity than heating, which makes windows that can reduce the costs from both real winners. Kurtz hopes to have these retrofit window films on the market by late 2018, and the company has filed several patents. IR Dynamics is also partnering with a leading corporation in the window-film and structural plastics industries and a leading company in the high-performance fabric industry. "Usually the things we do are in technical journals or are presented at specialized conferences. It's rewarding to see things go from idea to a commercial product," said Clem. "For this company, we can point to five new jobs that all started from the first NMSBA grant. Seeing new companies start up and grow knowing you've given them a technical boost is satisfying." This story is adapted from material from Sandia National Laboratories, with editorial changes made by Materials Today. The views expressed in this article do not necessarily represent those of Elsevier. Link to original source.